Posted on January 19, 2015 by Atul Gupta. West Bengal Board of Secondary Education or WBBSE was established in 1951. The West Bengal Board of Secondary Education (in Bengali: মাধ্যমিক শিক্ষা ওয়েস্ট বেঙ্গল বোর্ড) is the state government administered autonomous examining body for the WBBSE Class 10 exams in West Bengal, India. WBSSE is Headquartered at Nivedita Bhaban, Bidhannagar, Kolkata. 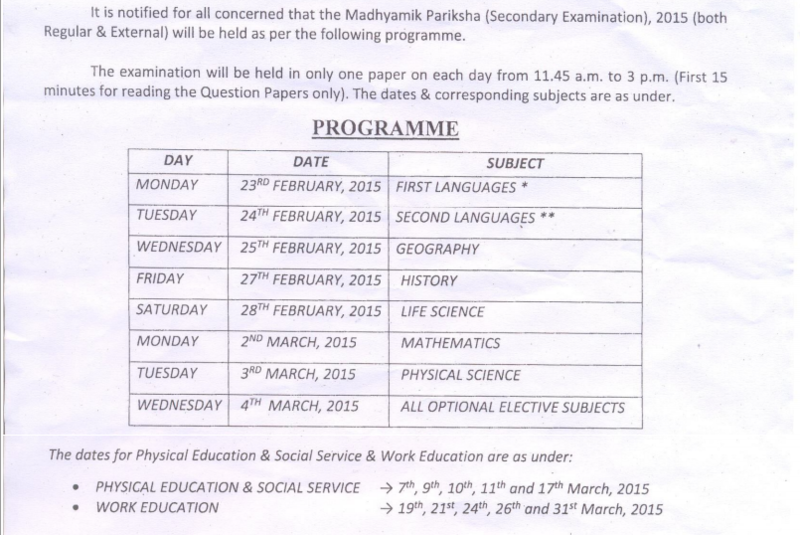 The West Bengal Madhyamik Routine 2015 is Live now. WBBSE regulate, control and develop secondary education of the state. More than 1,050,000 students take part in examination every year.Every schools of West Bengal must get Board affiliation for the valid process.The Wbbse Madhyamik Pariksha Routine 2015 is released. Board provides every exam related wbsse sample question papers, textbook, revised set of syllabus and other study materials to the students. IndiaResults.com officially publishes WBBSE board Class 10th Routine, Syllabus, Time Table, Admit Card and Hall Ticket of exam year 2014 at official website. IndiaResults is the leading online exam result publishing Portal in India. We are premier result publishing unit for West Bengal Board. We are team of dedicated professionals and work with accuracy. Students can know their results by Name wise search options on the result page of WB Board Madhyamik results 2015 on WBBSE official web page at IndiaResults.com.